The blog of CourtArtist: going where cameras cannot has just put up a sketch of Day 2 of the Kitzmiller case. In the scene, the lead plaintiffs’ witness, Kenneth Miller, is being cross-examined by Robert Muise of the Thomas More Law Center. 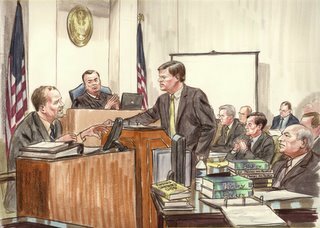 The CourtArtist blog is the blog of Art Lien, who says he is the NBC courtroom artist who usually covers the U.S. Supreme Court.